“It was in fairy-stories that I first divined the potency of the words,” writes J.R.R. Tolkien, “and the wonder of the things, such as stone, and wood, and iron; tree and grass; house and fire; bread and wine.” For Tolkien, dismissing fantasy stories as irrelevant to the modern world because they take place in alternate worlds with improbable creatures or different physical laws than our own is missing the point of such stories. Fantasy tales, for Tolkien, C.S. Lewis and the other Inklings of 20th-century Oxford, are actually a grand celebration of our own world, providing fresh eyes to see its familiar elements. 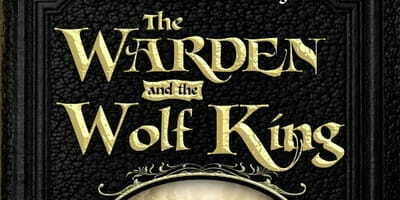 In such a manner does Andrew Peterson’s The Warden and the Wolf King, the fourth and final volume in the award-winning Wingfeather Saga, celebrate our world, though it takes place in the fictional world of Aerwiar. Food, song, good company, and the grace and beauty of the Creator all are rendered so lovingly that it makes one finish the book with a renewed appreciation for all these things in his own life. With this rich and rousing tale which images the beauty of the Gospel story of brokenness and redemption, Peterson certainly earns a place as honorary Inkling. As has been the case with each preceding volume in the Wingfeather Saga, Peterson’s prose is richer than before, the scope is broader, and the story is more masterfully told. And, thanks to a successful Kickstarter campaign to fund the book, the final volume receives the hardcover treatment, sprinkled throughout with the illustrations of Joe Sutphin. Fans of the series will thrill to see beloved characters like Oskar Reteep*, Podo Helmer, and Armulyn the Bard come to life through Sutphin’s evocative drawings. Since the publication of the series opener, On the Edge of the Dark Sea of Darkness in 2008, the Wingfeather books have followed the adventures of the Igiby siblings –Janner, Kalmar, and Leeli. In the first book, the siblings learned they were actually the Wingfeathers, heirs to the throne of Anniera, an island kingdom which lay smoldering after the destructive hand of Gnag the Nameless. Gnag’s minions, known as Fangs, now overran the Igiby’s hometown of Glipwood. As book three, The Monster in the Hollows, ended, the Wingfeather clan hunkered down in the Green Hollows and prepared to lead a final defense against the onslaught of Fangs sailing toward Ban Rona, the village on the eastern shore of the Dark Sea. Although the final battle comprises the action of the story, this is far from a War Book. The central characters are spread across Aeriwiar, engaged in various endeavors. Leeli, her mother Nia, and grandfather Podo Helmer remain in Ban Rona holding back the forces of Gnag, while Janner and Kalmar head for the Castle Throg high atop the Killridge Mountains, bringing the fight to Gnag to prevent endangering the Hollows with their presence. Throughout the series, Gnag has been obsessed with the Wingfeathers, whom he dubs the Jewels of Anniera, seeking them for some unknown purpose. In Warden, we learn what that purpose is, in addition to the true identity of Gnag, the origin of the creatures dubbed “cloven,” and the depth of the Maker’s relationship with the land of Aerwiar. The story winds its way to a surprising climax at the final battle for Ban Rona, and an even more breathtaking twist following the battle, both events which are sure to leave devotees of the series talking.